When you need to improve the appearance and value of your home on a budget, find the affordable laminate flooring you need at our flooring superstore. When you browse the aisles and displays in our spacious showroom, you can find a vast inventory of stylish and durable laminate floors. This popular cost-effective option is ideal for busy households. The staff at our laminate tile flooring store is happy to assist you every step of the way with your new laminate flooring—from selection to installation. We carry all of the most popular brands and manufacturers, and we remain knowledgeable about every style in our store. Once you have made your flooring decision, schedule an appointment with our professional laminate floor installation crew. We believe in service after the sale, so we provide affordable options on all installation services. As soon as you step in our store, you’ll notice how friendly our associates are. Even though we’re a part of a national franchise, our store is locally owned and operated, which gives it a community feel. Our personalized service and attention to detail is what separates us from our competitors. Have you always wanted wood flooring in your property, but for various reasons have been unable to upgrade your floors to natural hardwood? 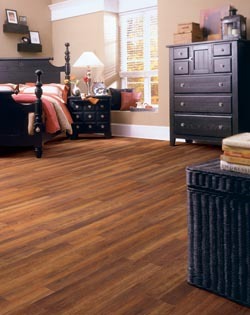 Our laminate wood flooring is affordable and easy to install. It looks just like natural wood flooring and offers style along with practicality. Laminate floors are made of four basic layers that, when put together, emulate wood. Our associates help you find laminate wood in a style that suits your property and at a price within your budget. The replication process allows you to emulate some of your favorite species of wood, including red oak, oak, walnut, pine, and cherry. Perhaps the one quality that makes laminate wood flooring stand out so much is its ability to replicate almost anything. Whether you want stone, tile, or hardwood, technology has made it possible replicate the look of all three of these natural materials and more. This gives you virtually unlimited design possibilities throughout your space. You can give your property a more luxurious look without having to sacrifice your budget. Whether you want laminate wood flooring all throughout your home or different types of laminate floors in separate rooms, our flooring specialists can help you bring your ideas to life. Floors are not only a surface of which you can use to walk on. They’re also an investment and as an investment, you want to see your floors last for as long as possible. Laminate tile flooring is created from durable material that doesn’t break or crack. This type of floor is well suited for homes with heavy foot traffic where spills and accidents may happen more often than you would like. Laminate’s flat surface allows it be cleaned easily. It has a smooth texture and doesn’t have any grooves where dirt can be hard to reach. All that’s needed to maintain your floors is the regular use of a broom or mop. Our flooring specialists are ready to answer your questions about the different laminate manufacturers we carry. We can match laminate floors to your style and budget, so don’t hesitate to let us provide you with the assistance you need. Additionally, our floors are updated every season to assure you have the most diverse choice possible. Whether your home has a traditional and contemporary vibe to it, our store associates can help you find a surface that complements the aesthetics of your home. Our flooring store provides customers with top-tier laminate floor installation services. By letting one of our skilled technicians install your laminate flooring, you can be confident in the looks and longevity of your new floors. A novice installer could end up costing you more in maintenance and repairs in the long run. Our specialists have years of installation experience, and we ensure you flawless work performed with the utmost efficiency. In addition, we work around your schedule when we perform our installation services. We aim to impact your daily home routine as little as possible during the installation. In keeping with our dedication to customer service, we guarantee that each installation we complete is backed by our Ultimate Confidence Guarantee. After the installation, you have 30 days to get in touch with us to let us know if you are not satisfied with any aspect of your new laminate. If so, we will replace it with a similar product completely free of charge. We also have a Price Protection Guarantee to ensure we’re always offering you the most competitive prices on the market. If you purchase a product from us and then find that same product at a competitor’s store that’s sold at a lower price, let us know. As long as both products are of the same brand and style, we’ll refund the difference in the respective prices. Your customer satisfaction is one of our top priorities. Contact us for more information about our laminate flooring options. We sell and install laminate flooring for homes throughout the Lehigh Valley, including the communities of Bethlehem, Allentown, Easton, Hellertown, and Palmer, Pennsylvania, as well as the surrounding areas.